The images below are taken from our archive of photographs, postcards and other material. Select any picture to see more details. On 2nd November 1892 the Edinburgh to London express collided with a goods train near Thirsk. 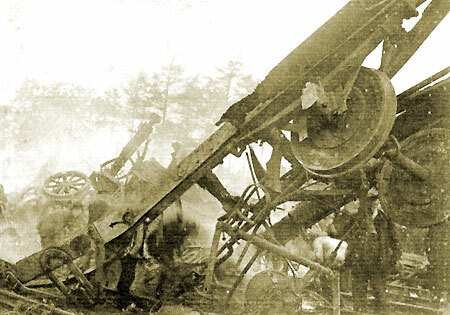 Ten people perished, thirty nine were injured. The crash was caused by a signalling error and poor visibility due to fog. This bus was owned by the North East Railway, who ran a service from Thirsk Station to the town. 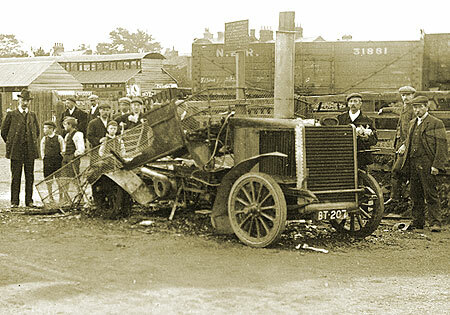 Steam buses were eventually replaced by petrol-driven ones. The wagonette may have been about to take the soldiers to the station. 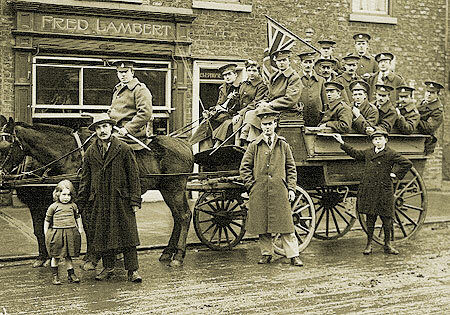 Lamberts fish shop was in Westgate, opposite the town hall. Earlier it had been the Star public house. 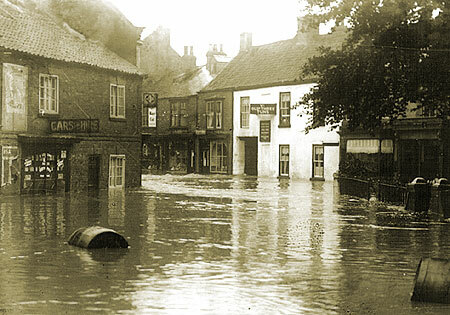 Barrels float gracefully along Finkle Street after Cod Beck overflowed on 23rd July 1930. This scene was echoed 70 years later when flooding affected much of Britain. 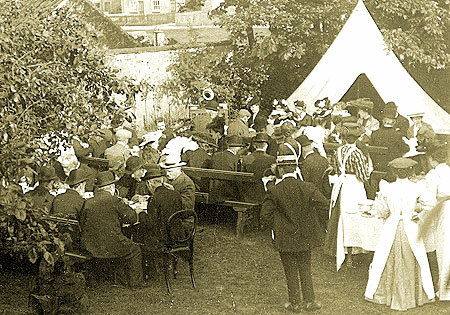 1902 saw the coronation of King Edward VII, and this garden party was organised in celebration. It took place at the Manor Farm in Sowerby, which is still used today for galas and fireworks displays. The new clock tower in the Market Place incorporated a drinking fountain, but there was no horse trough nearby. This scene, apparently showing a horse drinking from the fountain, was posed for the camera. 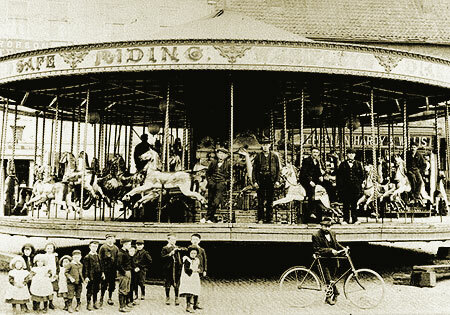 Children gather around a steam-powered roundabout outside the Three Tuns Hotel in the Market Place. The Freeman Hardy Willis shop, just visible in the background, closed in 1999. 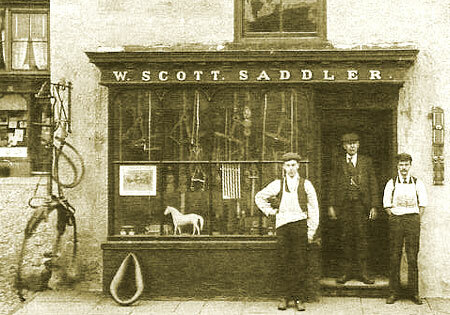 William Walter Scott opened his shop in the Market Place in 1870. 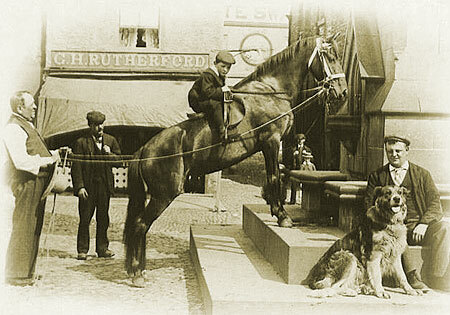 In 1908 the business moved to another shop in the Market Place, where it remained little changed for over 90 years. It finally closed in 2000. 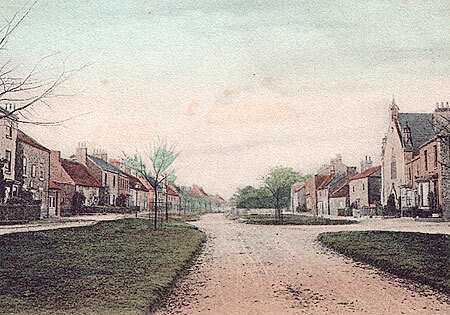 This hand-tinted photograph shows Front Street, the road linking Thirsk to the village of Sowerby, as seen from the south. Apart from the trees by the road, which are now much taller, this scene has hardly changed. 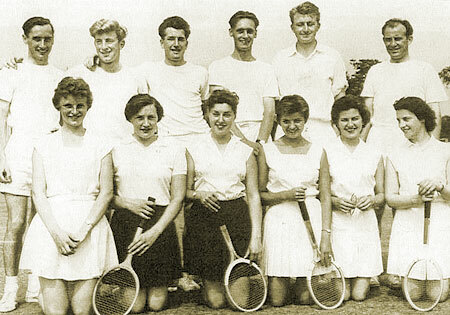 Gathered together for this group photograph are the members of the Thirsk Athletic Club Tennis Team in the Open Tournament of 1955. 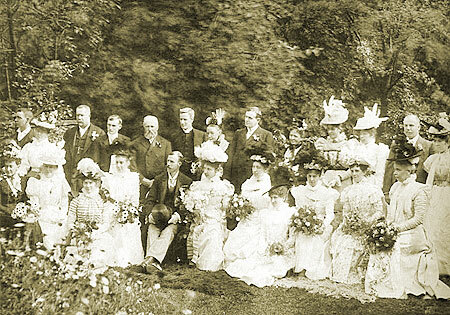 The groom is Edward Brookwell Peat, whose family owned a printing and publishing business in Thirsk. The bride is Lucy Annie Robinson, the daughter of a well-to-do farmer. 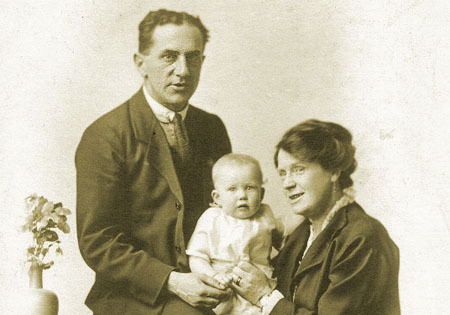 Harry, Cynthia and Bel Horner sit for a studio portait by J.R. Clarke of Thirsk. Joseph Robinson Clarke was born in Stockton-on-Tees in 1840. He joined his younger brother John in establishing a photography business in his home town before moving to Thirsk in 1870. Although much of his work was studio-based, Clarke covered practically every public event in and around Thirsk. His work is full of detail and carefully composed, while often looking entirely natural. Many of Clarkes photographs can be seen in the Museums archives as prints, postcards and cartes de visite.